This course, taught by Professor of American History and Director of the Gilder Lehrman Center for the Study of Slavery, Resistance, and Abolition at Yale University, traces the American Civil War from its antecedents in the 1840s to its effects in the late 1870s. Taking into account national, sectional, racial, constitutional, individual, social, intellectual, and moral meanings that the war has held for American politics and civic life, the course is a must for readers serious about understanding America's bloodiest war. Interested readers may like to begin by exploring the syllabus before delving into the 27 lectures of the course (under the Sessions tab). Each lecture features an introduction and an embedded video (complete with transcript), as well as Lecture Chapters that help divide the content into easily digestible pieces. 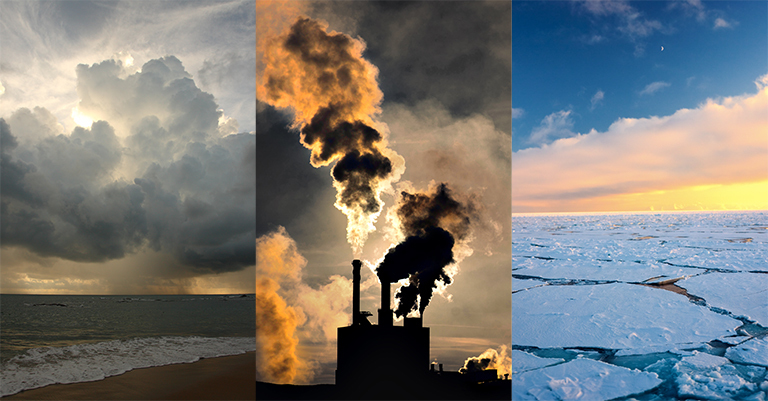 NASA's Global Climate Change: Vital Signs of the Planet website features a diverse set of resources related to the measurement, analysis, and dangers of global climate change. Here readers will find a collection of Interactive Features all designed to bring to life the sometimes abstract conclusions of scientific articles on climate and its effects on human and other life on Earth. For example, the Climate Time Machine allows readers to go backward and forward through four different key climate indicators, including Sea Ice, Sea Level, Carbon Dioxide, and Global Temperature. Perfect for educators who are looking for impactful visual representations of the rising temperatures on the planet, the interactive makes these measurements visceral in a way that charts and graphs are seldom able to do. Other interactives on the page include the Global Ice Viewer, Quizzes, The Sun: A Virtual Tour, The Water Cycle, and others. Annenberg Learner is known for providing well designed resources for teachers, and these eight sessions dedicated to getting educators ready to teach physical science to elementary school students are no exception. Educators may like to peruse the Course Overview and Course Structure sections before delving into the Workshop Sessions themselves. In sum, these sessions are designed to help elementary school teachers brush up on their basic science so that they can better guide their students in outcome motivated learning. Sessions cover such topics as What is Matter?, The Particle Nature of Matter: Solids, Liquids, and Gases, Physical Changes and Conservation of Matter, Chemical Changes and Conservation of Matter, and others. By participating in this free, online course, educators will gain much needed background knowledge in the physical sciences, allowing them to better introduce their students to these fascinating subjects. With its $100 million annual budget, the Brookings Institution, which celebrates its centennial this year, is one of America's most powerful shapers of policy on a range of issues. This section offers readers a peak into the Institution's latest analyses on defense and security issues. Topics include a somewhat pessimistic view of America's attempts to retake the city of Mosul from ISIS fighters, a call for modest expectations in the Obama administration's diplomatic efforts to institute further arms control measures with the Kremlin, and a report about Saudi Arabia's new diplomatic overtures toward India (and away from Pakistan). For readers looking for educated opinions on the state of America's security situation, and developments of defense around the world, these blog posts, opinion pieces, and other informative bits will provide an erudite overview of the latest news. This self-paced online course from Harvard University begins on May 3, 2016 and covers the diverse range of beliefs and practices Buddhists have engaged with over time and across a multitude of geographies. Led by Yehan Numata Senior Lecturer in Buddhist Literatures, Charles Hallisey and doctoral student Alexis Bader, the course uses scriptural and informational readings to take readers into the complex matrix of art, devotional acts, and literary works that make up the ancient religion. No prior experience is required. To sign up, simply select Enroll Now and provide the required information (email, username, password, and a few other questions). From there, readers will begin receiving information as the course begins before proceeding at their own pace. There is option to either audit the course (free) or receive a verified Certificate of Achievement ($50). Discovery Education has assembled this lesson plan to unpack the Power of Fiction. Intended for the high school English classroom, this activity examines Upton Sinclair's muckraking novel, The Jungle, as well as student-selected works with strong social-action themes. The lesson plan begins by reviewing the main literary elements of Sinclair's novel (setting, plot, characters, and central conflict), before explaining the historical context of the early 20th century, in which workers were placed in unsanitary and often dangerous conditions. Students then discuss whether they believe The Jungle is successful in its message before having them look closely at their own novels. Suggestions are provided for possible titles within the categories of Civil Rights, Women's Rights, International Issues, and the Immigrant Experience. The United States Congress established the James Madison Memorial Foundation in 1986 in order to better teach the constitution in high schools across the country. Fellows are drawn from students who plan to become teachers. In exchange for graduate school funding, selected students agree to teach history and civics for at least one year after graduation. This page gathers together various "powerful" lesson plans composed by past fellows on topics related to constitutional history and government. The lessons are divided into sections that cover Articles I-VII of the constitution, Lessons About Constitutional Connections, Lessons on the Federalist Papers, and Freedom and Slavery in the Early Republic. Financial reporting, in the form of balance sheets, profit and loss statements, financial notes, and disclosures, is an essential means of communicating information about the financial condition of a company or other organization. Generally Accepted Accounting Principles (GAAP), in turn, are the guidelines that help accountants with that communication. This site, from the Financial Accounting Foundation (FAF), helps readers understand the ins and outs of GAAP. Readers not familiar with the field may like to begin with About GAAP, before moving on to tabs dedicated to GAAP & Private Companies and GAAP & Not-For-Profits. Other interesting sections include GAAP & Public Companies, GAAP & State and Local Governments, and Simplifying and Improving GAAP. There is also a section dedicated to videos that explain basic GAAP principles.